[By Nick, New for 2016] DQ is the latest company to join in on the "core" trend but I honestly don't really understand the appeal of these products. People will defend it saying "you get to control how much goes into each bite". I mean, I guess that's true. However, the cores just never seem to work out. They're too potent to me and would be much better as a swirl. I don't know, analyzing trends is one of my favorite things and I just can't wrap my mind around this one. Whatever, rant over. Let's talk about the last of the new Royal Blizzards that we have left to cover. The blizzard is your normal blizzard for the start. 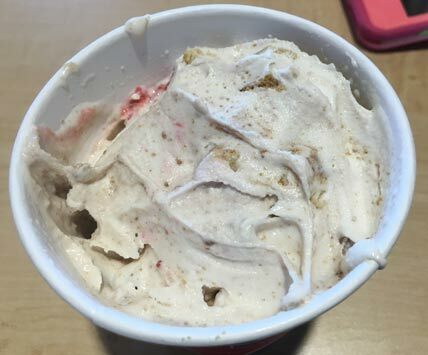 The graham crackers blended perfectly into the soft serve giving you a very graham-y treat. 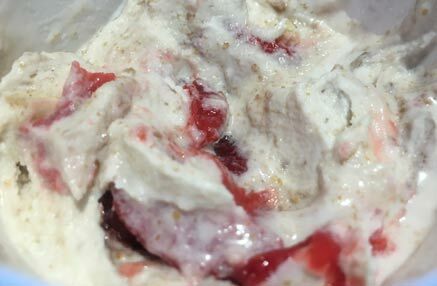 There was an ample amount of cheesecake chunks which when mixed with the graham cracker made this taste like pure cheesecake. The cheesecake pieces aren't too cheesy but they do have enough of it. If you were to eat them on their own however, then you do get a nice cheesy punch. 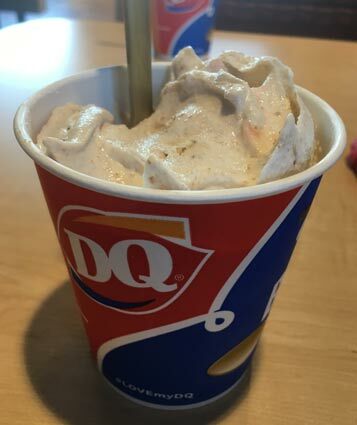 Now if this was a cheesecake blizzard, this would be great. Problem is that this is supposed to be filled with strawberries. I didn't notice really much strawberry until a third in and it was more of a swirl. The strawberry flavor is a little on the artificial and sugary side to be honest. When you finally hit the core, you do get a bunch of cut up strawberries. Problem is that they taste like they've been frozen and kept in a fake strawberry topping. Safe to say, I was not amused. As my rant at the beginning went, this is why I'm not a fan of cores. They're too much on their own. If they were spread out, this would be more tamed and balanced. But when it's all stuck together, it's a mess. Once I had a bite with all the strawberries, I couldn't keep eating. I know this would be a good blizzard if the strawberries were mixed in but with it as a core, I can't recommend this one bit.